Beautiful! I can't wait to try it! They would look great on package tags too! if you can't find the beaded candy canes, make them using floral wire stem cut into 3 equal pieces and use faceted beads in whatever color you want,and just curl the ends before crocheting arond the beads made some for decorating xxmas gifts and everyone liked them thanks for the idea! Very, very nice! I love them. My tree is all gold, white, and purple,and these ornaments lend themselves to being made to match! Great pattern, Suzie! 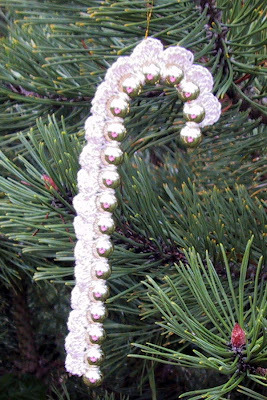 It isn't made with beads, it is a candy cane shaped decoration.